As its name gives away, this new generation of extension lash is pressed to the even flatter ellipse shape than a normal Flat Lash, resulting 75% lighter in weight. 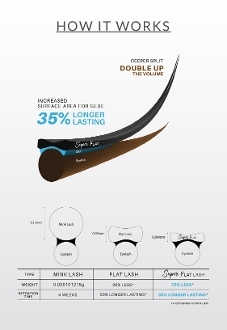 Plus, its wider surface area for glue leads to 35% longer retention time than normal extension lashes. The new flat ellipse Lashes give the look of a .20mm with the weight of a .07mm lash. With the ellipse shape these lashes are easy to place on the natural lash and also they are easy to stack lashes on top of them. These lashes are flatter and offer a more voluminous look. The "flatter" lash also allows for a more simple application.